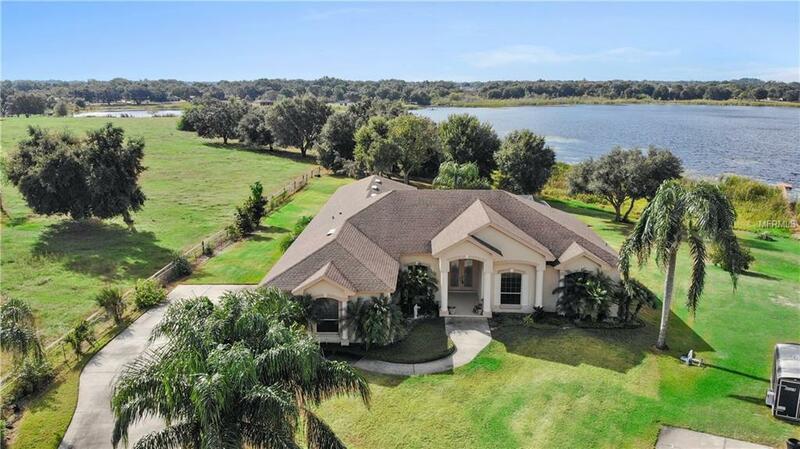 Lakefront Custom Built Home, one of Polk County's Premier builders! This premium built home features 4 or 5 split bedroom plan w/two Master Bedrooms and 2.5 baths, office w/closet (5th bedroom), formal areas are nicely appointed including: Designer Glass French Door entry w/Foyer, Crown Molding in all the main rooms, fully appointed kitchen w/LG stainless appliances and Crown Molding Cabinetry and a pass-thru window to the pool balcony entertainment area. The main Master Suite is 22x17 and includes a lounge area and view of the lake with access to the pool balcony entertainment area. Master bath includes: dual sinks, make-up desk w/mirror, elegant Garden Tub and a Walk-in Glassed Shower (no door), his & hers Walk-in Closets and additional linen closet. Every bedroom is large and has its own walk-in closet. The exterior features a side entry garage that accommodates 3 cars and double parking drive. Home is positioned at the very end of Shaman Ct., this property's boundary encompasses approximately 6.8 acres water inclusive making this waterfront a true lakefront with Littoral Rights. Land is deep well irrigated "save on water bills". The waters edge skirts approximately 438 Ft +/- on the lakefront with approximately 2.19 acres dry land and the home sits high on the hill - a beautiful view of Lake Grassy from all the main rooms, bedrooms and pool area. One or more photos has been staged and/or photo corrected. Call today to preview this beauty! Additional Water Information Lot Extends into The Lake Making This Property A True Lakefront With Littoral Rights Commonly Called (Riparian Rights). Approx. 438 Ft Frontagepublic Boat Ramp Across The Lake For Access To And From This Lake. Private Community Boat Ramp into Spirit Lake. Pet Restrictions Maintained On Leash Offsite.